Parenteral Nutrition Market size is set to exceed USD 5,704.6 million by 2025; according to a new research study published by Global Market Insights, Inc. Rising prevalence of chronic diseases such as diabetes in the past few years and increasing trends of malnutrition across the globe primarily drive the demand for various parenteral nutrition products worldwide. Additionally, growing birth rates and increasing incidence of pre-mature births should augment market demand during projection years. Various government regulatory bodies such as, European Society for Clinical Nutrition and Metabolism and FDA, impose strict government norms in the approval of parenteral nutrition products. As well as, Inadequate infrastructure in developing and under-developed regions acts as a growth hindering factor. Also, lack of awareness among the population of emerging markets happen to hamper adoption rate. Hence, the aforementioned reasons tend to stand as barriers in the parenteral nutrition market growth. 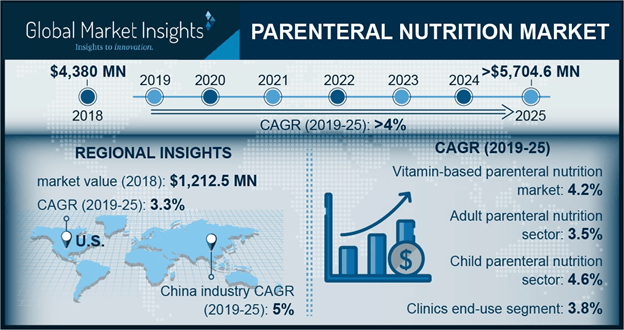 Amino acid parenteral nutrition market was around USD 1,752.4 million in the year 2018. Steadily growing acceptance of amino acid based parenteral nutrition products will augment industry growth in coming 5-7 years. However, due to increasing cases of renal insufficiency, hepatic insufficiency and protein-catabolic critical illness globally will boost the demand for amino acid based parenteral nutrition products. Additionally, deficiency of energy and dietary proteins are customary in critically-ill hospitalized patients that ultimately leads to protein-energy malnutrition. Hence, Amino acid-based parenteral products are provided to patients in such cases, hence rising its application during the forecast period. Child parenteral nutrition segment market is estimated to grow at a robust CAGR of 4.6% over the forecast period. The increasing burden of genetic and neonatal diseases will augment segment growth of the market. frequent rise in pediatric disorders will create mineral and vitamin deficiencies amongst children that will fuel the demand for parenteral nutrition products thereby, increasing market growth. Also, initiatives adopted by various organizations such as, knowledge sharing programs for individuals regarding essential nutrients necessary to infants will augment neonatal parenteral nutrition market. The use of parenteral nutrition in hospitals valued around USD 3,155.4 million in the year 2018. Availability of advanced therapeutic solutions in the hospital settings will boost the demand for parenteral nutrition products. Patients suffering from critical medical conditions are mostly in treated in hospitals where they are administered parenteral care, thus presence of state of art facilities in the multi-specialty hospitals and growing popularity of hospitals in developed countries will augment market size over the projection years. The U.S. parenteral nutrition market is estimated to grow at a CAGR of 3.3% over the forecast period. U.S. represents major regional market share followed by Canada. The region will witness a lucrative growth due to growing healthcare expenses coupled with increase in awareness amongst the population about parenteral nutrition products and rising prevalence of cardiac diseases. Improving healthcare infrastructure, developing and expanding hospital sector, and presence of major industry players such as B. Braun with rapidly expanding business led by international pediatric nutritionals will increase regional market share. Thus, the above mentioned reasons will fuel parenteral nutrition market growth. Some of the key industry players operating in global parenteral nutrition market are Aculife Healthcare, Amanta Healthcare, B. Braun Melsungen AG, Baxter International, Inc., Fresenius Kabi AG, Grifols International S.A., Guangzhou Baiyunshan Mingxing Pharmaceutical Co. Ltd., Guangzhou Green Cross Pharmaceutical Co., Ltd., and ICU Medical etc. The industry participants focus on acquisitions and mergers, new product developments and geographical expansion to increase their foothold in the market and gain competitive advantage.